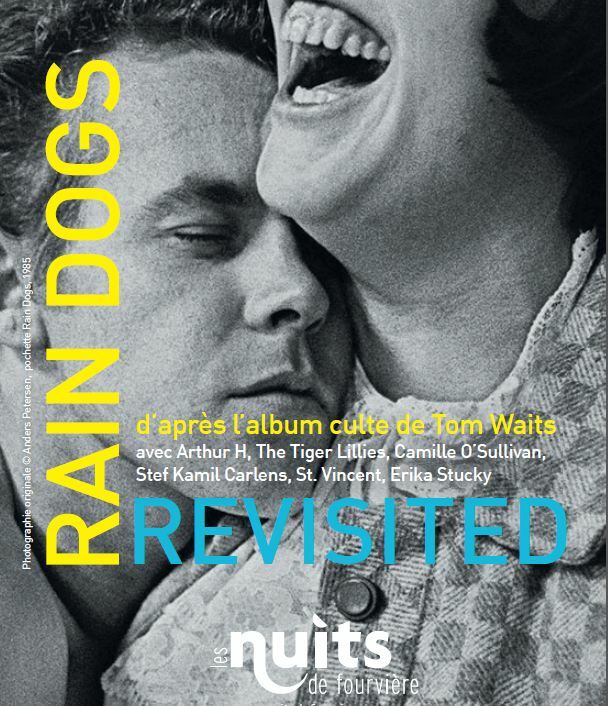 Rain Dogs, released in 1985, is an object of fascination for Tom Waits fans. In a very personal evocation of the New York slums, the album’s nineteen tracks impress us with their variety, borrowing from cabaret, polka, jazz, rock and even spoken poetry. The use of numerous instruments adds to the album’s character: pianos and organs, saxophones, trumpets and trombones, drums, marimba and congas, and of course, guitars and accordions. This concert takes us back through the album – integrally, though quite freely. Especially brought together for this event, a prestigious band will offer a similar, although not quite identical, array of the rich instrumental variety intended by Waits. David Coulter, the multi-instrumentalist who worked with Tom Waits on The Black Rider, is the concert’s musical director. Richness and freedom are also guidelines for the artists who bring the album’s lyrics to life. Though Arthur H sings with a husky voice recalling that of Tom Waits, the other soloists rather take the opposite course. Those who do so in particular are the female artists like the exuberant Irish singer, Camille O’Sullivan who has already tried her hand at Tom Waits’ repertoire in her unbridled cabaret rock shows; there is also the American St Vincent who brings a whole new outlook to the lyrics, presenting them in expurgated versions; and the Swiss American singer Erika Stucky, known for her soul-rock yodeling and her eccentric musical revivals. On the other hand, the Belgian singer and guitarist of Zita Swoon Stef Kamil Carlens, and the British trio The Tiger Lillies, who are fond of rare and strange instruments and whose musical universe is, like Rain Dogs, inspired by Kurt Weill, will take the performance to another unexpected level, faithful in this to both the spirit and the letter of Tom Waits’ piece of work.